Robert Scott Kellner is a retired English professor and editor and translator of his grandfather's diary, My Opposition: The Diary of Friedrich Kellner - A German against the Third Reich (Cambridge University Press, 2018). "This imbecile has us especially close to his heart. He makes no secret of his hateful feelings. He does not greet my wife at all and ignores me unless it's for official business," wrote Friedrich Kellner, courthouse administrator in the small German town of Laubach, on January 23, 1943. The "imbecile" was Heinrich Scherdt, the court constable, who had been directed by the local SS unit, a branch of the Gestapo office in Giessen, to report on the Kellners. Friedrich's wife was Pauline: Karolina Paulina Preuss Kellner of Mainz. A week before this diary entry of January 23, she and Friedrich celebrated their thirtieth wedding anniversary, of which only a single year, their first, had not been marred by war, political strife, or totalitarian rule under a murderous regime. It almost ended in 1914 when Sergeant Kellner, serving in the Kaiser's army, was wounded in a muddy trench in France. They survived the Great War, but it seemed less likely they would survive this, their second war, resolved as they were to record Nazi crimes for posterity. Her early years were unremarkable but happy: attentive parents; mischievous siblings; school lessons and flirtations; camaraderie with secretarial friends at Schöfferhof Beer Company. Everyone Pauline knew was at peace with each other. Order and justice seemed assured. But Europe's emperors were not at peace. When her young husband's leg was riddled with artillery fragments in the service of "Kaiser, Folk, and Fatherland," and her brother was listed among the missing in action, never to return, Pauline understood the evanescence of order and justice, and that neither was a match for machine guns. When the Great War ended, Pauline and Friedrich welcomed the dissolution of the monarchy and rise of the Republic. They formally withdrew from the Evangelical Lutheran Church "because it and a great many of their ministers behaved un-Christianly" in their voluble support for an unnecessary war. Friedrich became an organizer for the Social Democratic Party, and Pauline formed a political club with other young mothers. For a decade the Weimar Constitution held sway over Communist paramilitary groups and Nazi stormtroopers. But the economic catastrophe of 1929 ultimately brought Adolf Hitler, with his promises to restore Germany's standing in Europe, to power. Even the Kellners' teenage son, Fred, clamored to join the Hitler Youth. "The youth have been contaminated through and through by the spirit of Hitler," Friedrich sadly wrote. The cultured nation of Gutenberg, Schiller, Goethe, and Beethoven began its devolution into barbarism. The New Order was established, one without justice. To avoid Hitler's revenge against those who had opposed him, the Kellners moved to the small town of Laubach in 1933, where Friedrich's position as courthouse manager included an apartment for them in the building. Though no one knew of their political activities in Mainz, their refusal to join the local Nazi Party immediately put them under suspicion. In 1935, just two years into the Third Reich, their son lost some of his enchantment with the Nazi agenda, specifically the mandatory work service for young men and conscription into the army. Fred agreed to emigrate to America. Also that year, a Nazi rally in Nuremberg highlighted the malevolent spirit transforming Germany. Laws were passed that arbitrarily stripped German Jews of their citizenship and placed them under oppressive regulations. To abrogate the rights of people who had contributed over the centuries to Germany's development was "unworthy of a cultured nation," wrote Friedrich Kellner, "and the curse of this evil deed will indelibly rest upon the entire German people." As worried Jews sought to leave Germany, a Jewish woman in Laubach, Hulda Heynemann, approached Pauline for help. The police had brought false charges against her son-in-law, Julius Abt, to confiscate his property. When Friedrich uncovered the truth, he and Pauline helped Abt get to the port in Hamburg to leave for America. The Heynemann's daughter, Lucie, expecting a child, remained behind until her child's birth. The Kellners helped mother and infant son get away as well. They tried to convince Lucie's parents to leave with her, but the Heynemann family had been in Laubach for generations, and the old couple felt certain their neighbors would do them no harm. The Kellners' willingness to go against the general atmosphere of anti-Semitism did not come from any personal associations. They had no Jewish friends; they hardly knew any Jews, which was not unusual, considering less than 1% of Germany's population was Jewish. They simply believed all people were the same: there was no master race and no subhumans. They would not compromise that belief to curry favor in changing political circumstances or hateful ideologies. They were guided by a very simple but profound rule: The Golden Rule, from the Sermon on the Mount. "Do unto others, as you would have others do unto you." Friedrich noted how Christian leaders failed in this respect. "The Church in Germany does not take a position about the terrible atrocities committed against the Jews." The Heynemanns made a mistake trusting their neighbors. On the moonlit night of November 9, 1938, during an orchestrated nationwide frenzy of religious and racial hatred, Friedrich and Pauline Kellner tried vainly to halt the mob seeking to attack the town's Jews. The judge who presided over the court, Ludwig Schmitt, refused Friedrich's request to bring the Jewish families into the building for protection. Pauline had no better success with Frau Desch, the head of the Nazi women's group, whose husband was a major Nazi figure. The Nazi stormtroopers were led by Albert Haas, the high school teacher. Rampaging with them were boys from the Hitler Youth, some in Haas's class. Jews were beaten, their homes ransacked. Furnishings, torah scrolls, and prayer books from the synagogue were tossed onto a bonfire. Even the Jewish dead were assailed, their cemetery littered with smashed tombstones. Friedrich wanted to press charges against the leaders of the stormtroopers, bringing his and Pauline's written testimony to Judge Schmitt. The judge angrily denounced him and said Frau Desch had demanded an investigation into Pauline's ancestry to see if she had Jews in her family—nothing else could explain why the wife of a justice official sent her son to America to avoid army service, did not cooperate with the Nazi women's group, and helped Jews. "And we have questions about you, too," the judge said ominously to Friedrich, telling him the matter was already in the hands of the state authorities in Darmstadt. Alarmed, Friedrich gathered his and Pauline's family documents, generations of birth and baptismal records providing indisputable proof of their bloodlines, and brought them to Hesse's capital. On November 18, 1938, Darmstadt Court President Scriba sent Judge Schmitt the Kellner documents with a terse memo: "I ask that you return the attached documents to the subject of this report. Doubts about his wife's German bloodlines cannot be validated." Undeterred, Frau Desch made repeated attempts to intimidate Pauline. With leaders of the Nazi Women's League and the Women's Block Warden Group in tow, she brought admission forms to the Kellners' apartment in the courthouse, sternly telling Pauline to complete them. "Despite their repeated efforts and intimidations, my wife never filled out a single form or became a member of any such organization. I would suggest that in all of Germany there are to be found few wives of officials who showed the same courage. Yes, she is most definitely courageous. The reader will understand when I propose here that a monument should be erected to my brave wife." In the end, the Nazi women settled for ostracizing her, and the Laubach SS placed Pauline and Friedrich under surveillance. Friedrich's position as a mid-level official provided some protection from arbitrary arrest, yet the couple tempted fate by adopting elements of active resistance: sharing news they secretly heard from BBC broadcasts and placing Allied airplane leaflets around town. They were well aware of the penalties for such actions; the newspapers were filled with stories of people being executed for listening to foreign broadcasts or distributing leaflets. With a touch of gallows humor, Friedrich pasted several of those news articles in his diary. 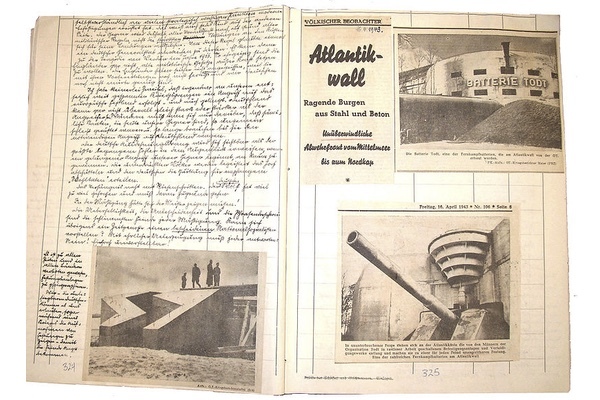 Friedrich began his diary on the first day of war, September 1, 1939, when German troops invaded Poland. He would fill ten notebooks (nine hundred pages) by war's end. The danger of his task was underscored early on. In 1940 he was called into the mayor's office for questioning about his "uncooperative attitude." While there, the block warden and one of the group leaders searched his apartment. Had Pauline not managed to hide the diary notebook beneath her blouse and sweater, Friedrich would have been executed as a traitor. And Pauline, whose strength and moral integrity reinforced her husband's determination to give a true accounting of events, would have shared his fate. The blitzkrieg against their neighbors, and the initial victories, did not spare the triumphant Germans from experiencing what they had avoided in the First World War: the ravages of warfare upon their own soil. Major cities in every sector of Germany were bombed and burned, and even the smallest villages mourned their sons who died in battle—this time for "Führer, Folk, and Fatherland." Soon Nazi victories turned into retreats, and die-hard believers like Constable Scherdt placed even more pressure on those they considered "defeatists." However, when Allied forces closed in on the Rhine, and Russian armies were in sight of Berlin, the Laubach townsfolk suddenly learned to nod cordially to the court administrator and his wife. On March 29, 1945, U.S. Army troops ended the war early for the inhabitants of Laubach. Learning of Friedrich's opposition to the Third Reich, the officer of the small command that would occupy the town until the end of the year appointed him first town councilman and deputy mayor. Friedrich worked to remove the local Nazis from their positions. Then he and Pauline brought together former Social Democrats and new recruits to rebuild their party. The Laubach branch of the Social Democratic Party elected Friedrich their chairman. In April 1946 the Kellners' son appeared in Laubach, wearing a U.S. Army uniform. Fred was not the nineteen-year-old youth who had left but a gaunt thirty-year-old, with eyes reflecting the shock of what he had seen that day traveling through the ruins of his homeland. It was the consequence of giving allegiance to an Adolf Hitler. He did not tell his parents the FBI had almost arrested him for involvement in the German American Bund in New York, and that he had joined the army to prove his loyalty. Fred did not return to America and his wife and children, but remained in Europe. At the age of thirty-seven, overcome by regret for his allegiance to the Nazi banner, Fred William Kellner took his own life, leaving his parents desolated. His ashes were placed in the American Legion Tomb in Neuilly, on the outskirts of Paris. It would be several years before a young man in a U.S. Navy uniform appeared at the Kellner's door in Laubach with a photograph of his father—their son—in his pocket. And for the last ten years remaining to Friedrich and Pauline Kellner, they worked with their grandson to school him in the diary with its clear distinctions between right and wrong. In 1970, after fifty-seven years of an eventful and consequential life together, Pauline and Friedrich Kellner died within months of each other. They were buried in their hometown of Mainz. In 2011 the diary was published in Germany to wide acclaim. The mayor of Mainz designated their gravesite an Ehrengrab, a Grave of Honor. And Laubach had a new street: Friedrich Kellner Strasse. Abridgments of the diary were published in Russia and Poland. 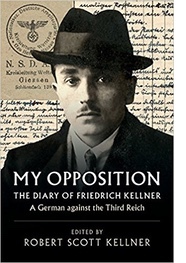 And in 2018 Cambridge University Press published the English translation, My Opposition: The Diary of Friedrich Kellner - A German against the Third Reich. In his tribute to Pauline for standing up to the Nazi women of Laubach, Friedrich said a monument should be erected to his brave wife. It might be said that no greater monument could exist for Pauline Kellner than the diary she inspired and helped to protect.